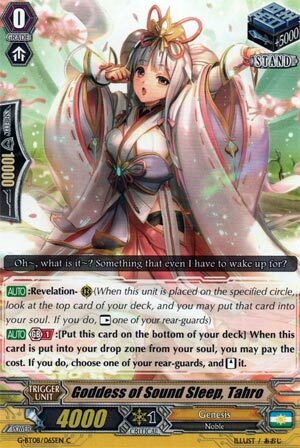 [AUTO]:Revelation-(RC) (When this unit is placed on the specified circle, look at the top card of your deck, and you may put that card into your soul. If you do, [Rest] one of your [Stand] rear-guards) [AUTO] Generation Break 1:[Put this card on the bottom of your deck] When this card is put into the drop zone from your soul, you may pay the cost. If you do, choose one of your rear-guards, and [Stand] it. All this time, she was here and yet we've never reviewed her? Madness. Now, I'm not a big fan of Stand Triggers unless their skills can usually net more of a gain than regular Critical Triggers. Tahro is one of the blessed few, if only because of the shenanigans with Angelic Wiseman. Aside from that, she has generally decent synergy with anything that can Soulblast during the Battle Phase, giving G-Genesis some much needed aggression from anything not called Regalia. Staple key to the Wiseman Loop whose infamy is well-known and therefore not really worth repeating. This card upsets me. On its own it happens to be fine, giving a unique method to Genesis for recycling triggers and restanding. The PROBLEM, however, is how it took Angelic Wiseman, an otherwise innocuous card, and made it into a nightmarish death engine that's almost impossible to stop once set up. If more cards like this keep slipping through, the game is going to break itself.